Hello everyone and happy hump day! How are you doing? I hope you had a lovely week so far. It's been a while since my last Inspired by post, hasn't it? Well, today I'm back with another Inspired by... feature. 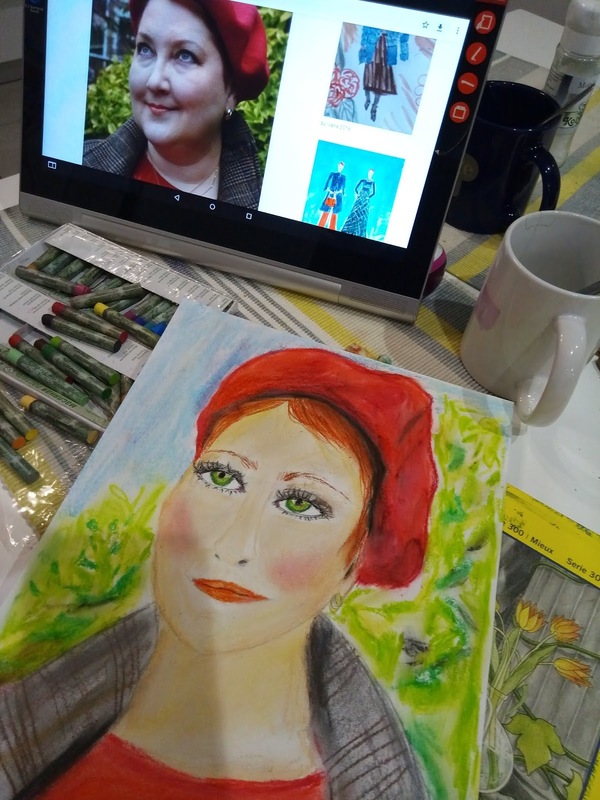 As some of you know, this is a regular feature on my blog that is all about illustrating bloggers I love and that inspire me. I always say it's one of my favourite features and it truly is. Over the years I had the chance to illustrate many many bloggers and it's always something I enjoy doing. Moreover, I enjoy blog recommendations posts and I'm sure I'm not the only one. I discovered some wonderful bloggers through other bloggers and that's always lovely. 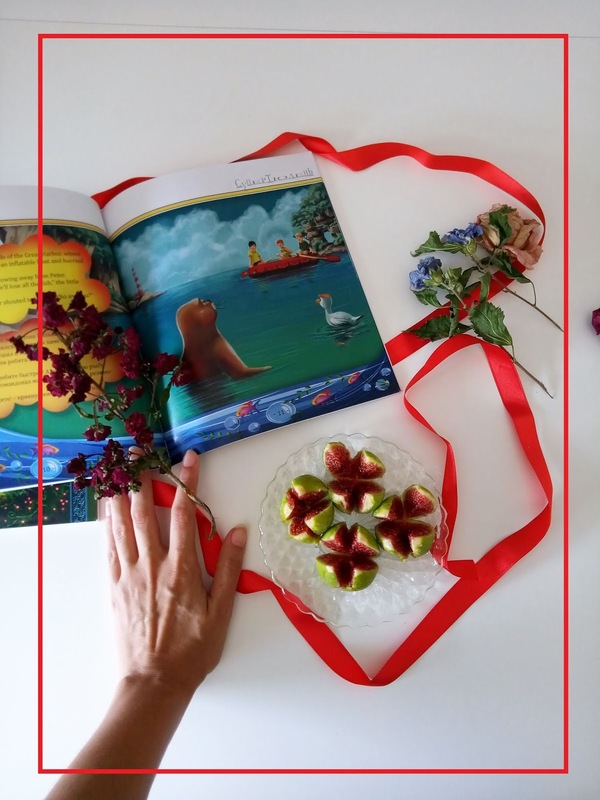 This regular feature of mine is not just about illustrating, it is also a kind of a blog recommendation post, because it gives me a chance to share bloggers I love with you. This time I have illustrated Natalia from @inthewriterscloset. You can check out her blog here. 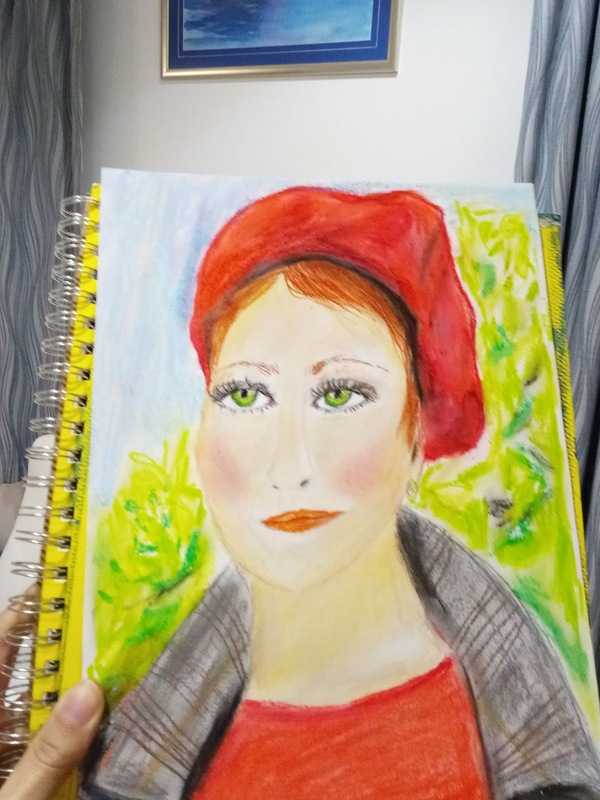 The first painting is a portrait painting done with pastels, you can see the post that inspired it by clicking this link. As I explained in one of my past posts, I'm quite new to pastels. I got these oil pastels from a friend (brand Sonnet, not sponsored) and I have had a mighty fine experience with them so far. I don't know why I thought painting with pastels was terribly difficult, isn't at all. I watched one YouTube video by some French guy whose English I couldn't understand but who had great painting skills so there was no need to understand him and then I drew this one- probably my first pastel attempt since I was a kid. It turned out alright, didn't it? 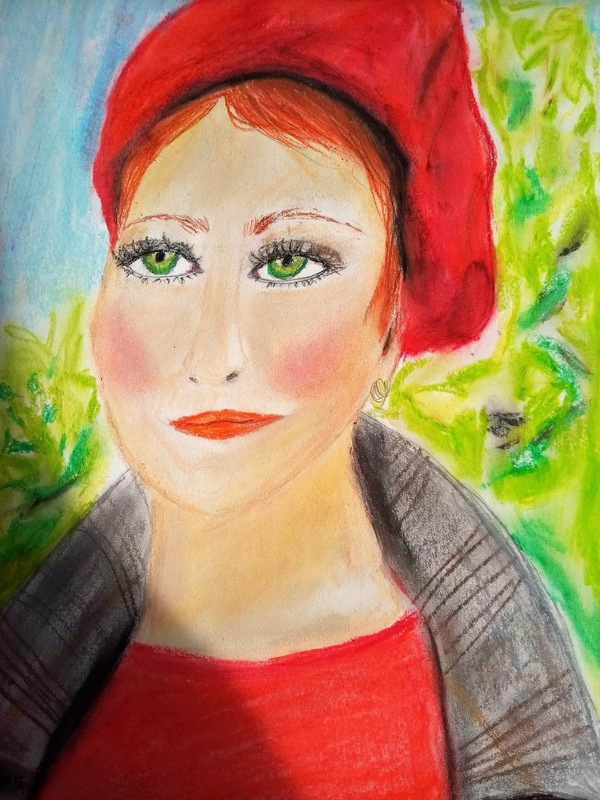 I just sketched in pastel then smeared it a bit, added a bit of eye-shadow to highlight (my little trick) and that was that. The paper I used for this portrait is a mixed media paper I got from Natalia a while back. Anyhow, this portrait was inspired by a recent post of hers, one that you can check out here. I love the colours in this outfit, and the those in the pastel illustration as well. Red is such a beautiful colour. I often glance at my copy of Pamuk's My Name is Red with satisfaction. That book has got one of the best descriptions of colour red in the history of literature. The medium for the second illustration is coloured pencils on paper. 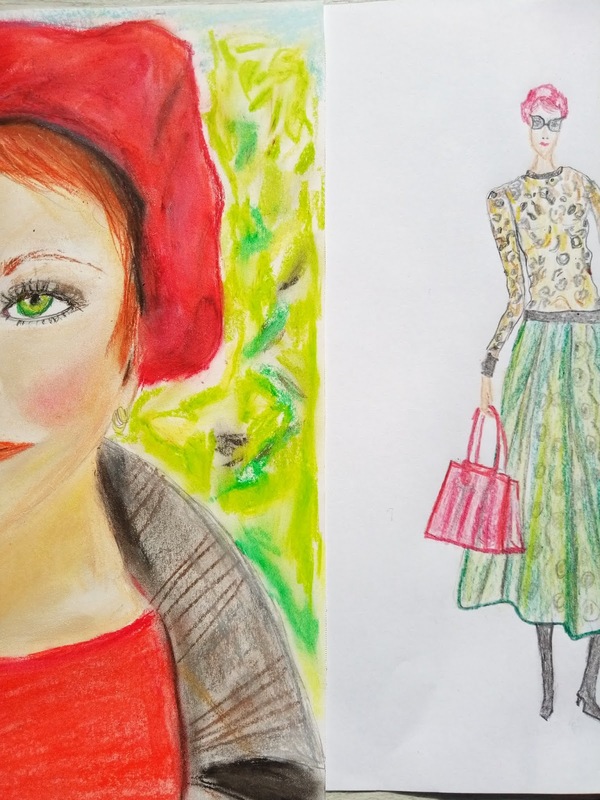 You can see the outfit that inspired this fashion illustration here. This second drawing I'm sharing with you is done in the typical fashion illustration style. As you know, I love fashion illustrations. I've been exploring fashion illustrating for a few years now, it's such an interesting field. I wrote about it a number of times, and you'll probably see me writing about it again some time in the future you know. If you do art, do you have a preferred media? How do you like these illustrations and outfits? I just love berets, how about you? 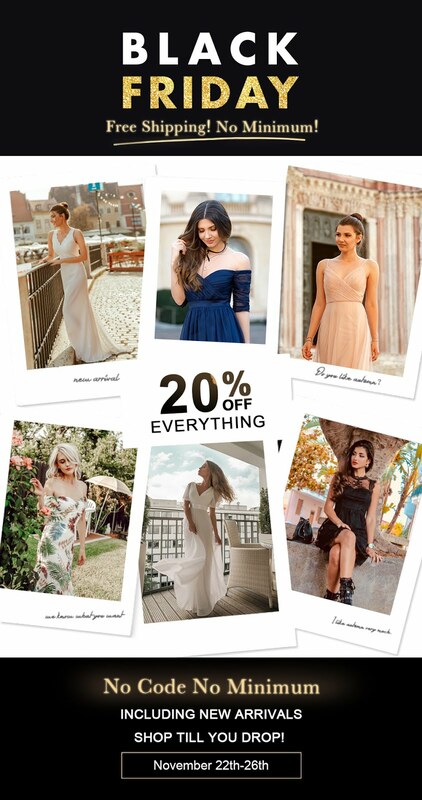 Natalia Lialina is a blogger based in USA. I've been following her blog for a couple of years now. She is also a writer and an author of wonderful children's stories (her site here). This is not the first time I illustrated her. 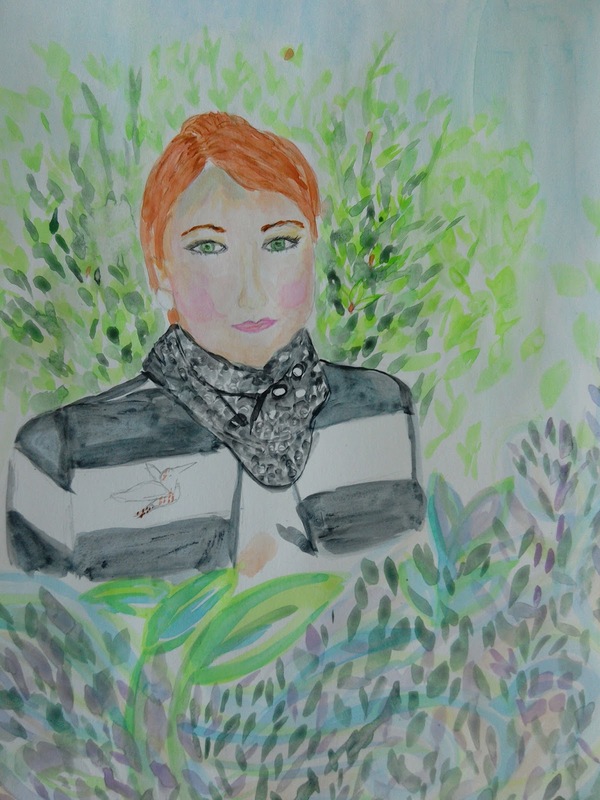 If you scroll down, you'll see another paintings I made of Natalia, this one was painted with watercolour. I love working in different styles and using different medias. Over the years, I've used a variety of mediums for creating art, even make up! Those of you who are regular followers of my blog are no strangers to my tendency and willingness to always try something new. I think it's healthy to always challenge ourselves, not just in art, but in every aspect of our lives. I work in all medias, from pencil and marker, to oil and acrylic. Modern and traditional art is equally fascinating to me. If you ask me what my favourite medium is, I would have a hard time answering. I feel like I do best in oil, but over the years I've really grown attached to acrylic paints as well. I also love watercolour. Oil pastels are a new medium to me and I'm very excited about seeing where they can take me. Here are links to some of my previous Inspired by features, in case you're curious about who else inspired me here, here, here, here, and here. If you want to be illustrated yourself, you can contact me via email. I might organize an illustration giveaway in the future if there are enough people interesting. So, if you want to see more illustrations giveaways, let me know in the comments. That would be all for today. If you are celebrating it, have a happy Valentine's day. If you are not, have a happy day too. As always, thank you for reading and commenting. Secondo me ti è venuto benissimo, soprattutto sono colpita dagli occhi, sono bellissimi! ANche tutti i colori che hai usato mi piacicono molto messi assieme! 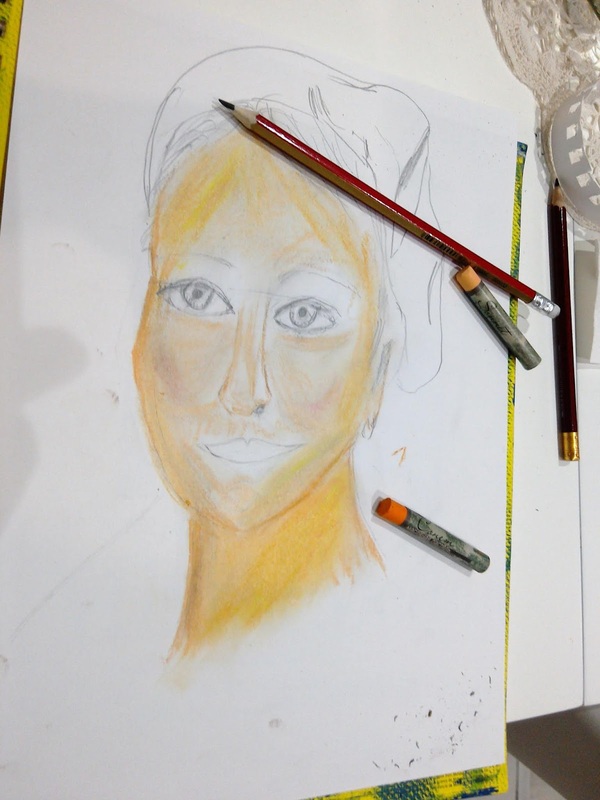 It's so fun you got to try these oil pastels, and you created some lovely illustrations! :) I would love to be more artistic, but I'm really not, haha! I had someone mention to me the other day that my blog and youtube channel must mean I'm very creative so I guess that's where my creativity goes, ha! that's true, blogging is super creative work. That is why there are so few artist bloggers. I heard artists say they don't want to blog because it takes their creative enegry. Dear Ivana, the illustrations turned out wonderful! And yes, for sure I love berrets and red belongs in general to my favourites. I think you are really able to capture the personality of the persons you illustrate and I think this is a true gift. Thanks a lot for sharing and enjoy Valentine's day as much as possible! yes, it does spark creativity. Thank you so much. Bellissime illustrazioni Ivana, mi hanno colpita molto soprattutto gli occhi, che risaltano davvero moltissimo soprattutto grazie ai colori che hai usato! Non conoscevo Natalia, ma sembra una persona davvero carina ed interessante! Wow! It's really very beautiful! I always love Natalia's style. She is so adventurous with her prints, and gives everyone such inspiration. 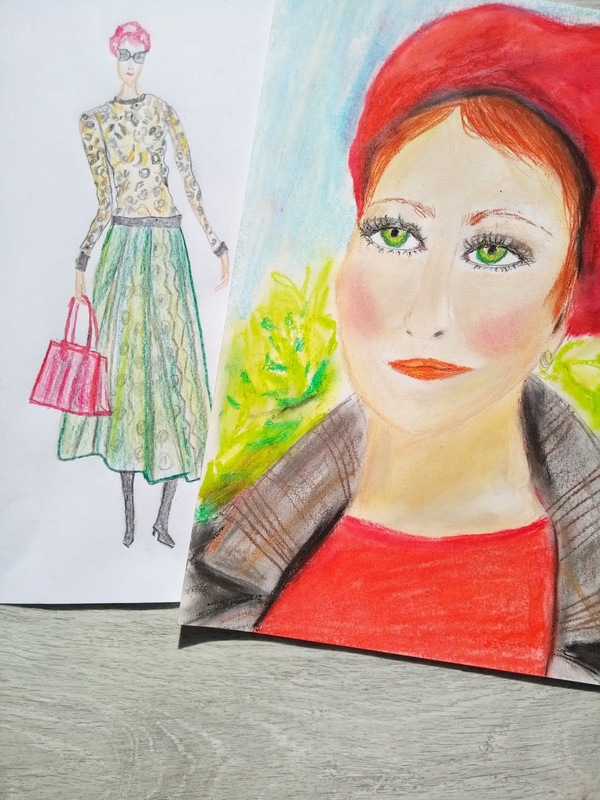 Your sketching is so wonderful to see, Ivana!! I'm so amazed how you just pick up a new medium and are already so great at it. And I wanted to tell you that I nominated you for the Sunshine Blogger award. The details are on my blog today!! Your friend Natalia has green eyes that you managed to capture very well in your illustration that btw is beautiful. I love to know that this is not the first time that you make an illustration of her and how she inspires you. The whole creative process is very well explained. This is amazing. I love the colors used in this portrait. It's so beautiful being inspired by others. Complimenti questi disegni sono bellissimi... Stupendo il colore degli occhi e tutti gli altri colori che hai utilizzato. Buona serata! Wow, these are so beautiful. I think it's such a wonderful idea to illustrate bloggers you're inspired by. You really drew her so beautifully. These illustrations are amazing! You are so talented - I would love to be creative like this! Dear Ivana, your drawing and painting skills are amazing! Like you, I also feel inspired by different kinds of art, and I understand why you feel drawn to experiment with different media. Your experiment with pastels is just wonderful - I wouldn't have thought that it was your first time trying, it's impressive! You, my dear, are very inspiring yourself - so much creativity that you direct in all different ways... you are truly a Renaissance person! I am very honored to have met you and become blogging friends with you! I will add a link to this post (under the portrait which is already on the right side of my blog). I love that you talk about inspiration and creativity here, and show your work in progress! Great to hear that! I do like the Renaissance period and the ideal of a Renaissance man (one interested in and educated about different things and fields). Your drawing is just wonderful hun!